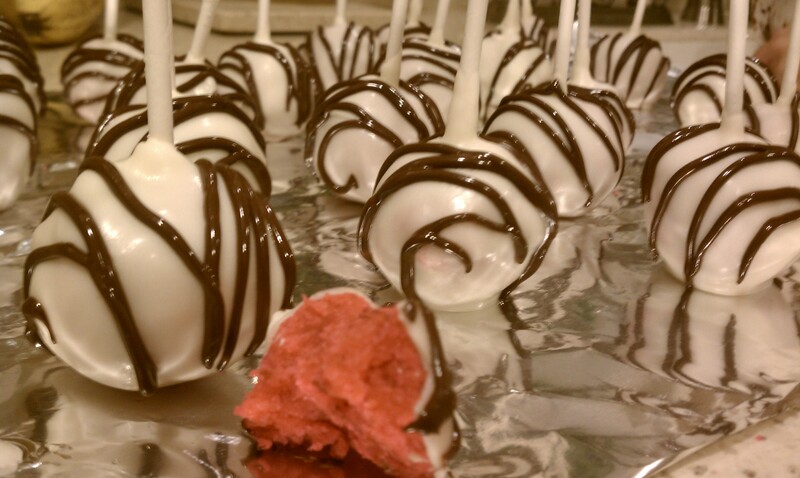 For my best friend’s birthday, I helped her make cake pops to give out as favors to her guests. These are zebra-striped to match her décor, but how cute would they be with a green chocolate drizzle for the holidays! This month, we will feature a new holiday cookie or treat every week on Fridays. These are so simple and will totally blow away every other cookie at your holiday cookie exchange. For a more casual approach, lose the stick and place a bunch in a pretty cellophane bag tied with ribbon. Bake cake according to directions. Once cool, crumble cake into large bowl and add frosting slowly, making sure the mixture just barely sticks together but isn’t too mushy. Form balls and set on cookie sheet covered with wax paper. Add sticks. Place in freezer for 15 minutes. Meanwhile, melt some white chocolate in a small bowl or skinny glass. Once the balls have cooled, cover them in the white chocolate, tapping them on the rim of the bowl to remove excess chocolate. Place each pop in a block of Styrofoam, or upside down on the wax paper if you don’t care about the tops getting flattened. (Since we planned to display them candy-apple style, upside down, we didn’t worry about it.) Melt the green chocolate and pour into pastry bag or small squeeze bottle. Decorate and let dry. 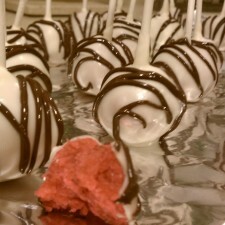 I am going to make these for my company xmas party….I think they’ll be a BIG hit!!! Everyone will love them Arlene! They were definitely a big hit at my friends birthday. Enjoy!